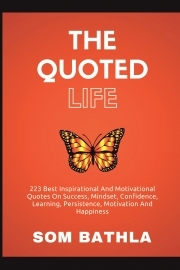 Description of "The Quoted Life"
The Inspirational and motivational quotes are the shortest form and the quickest dose of inspiration and motivation. Originated from our role models. Consistent reminders of what is possible. Helps instantly encounter negative feeling. Help creation of new belief System. Develop new perspective to see the world in abundant way. So, if you are looking for your daily dose of motivation and inspiration to get success faster, develop a positive mindset, build-up your confidence, this book is for you. This book will give you quick one liner quotes on staying persistent, the significance of life long learning and quick phrases on Happiness. This book is helpful for the motivation of men, women, children i.e. motivation for all of any age, gender, religion, geography etc. If you have already read inspirational quotes book, you will realize this book as different as it explains how to use these quotes by way of inspirational affirmations. It contains quotes which every man should know for leading a life full of confidence, happiness, and joy. So what are you waiting for? Go grab your daily dose of inspirational and motivational quotes. Now Scroll to the top of the page and click the “Buy Now” button. Som Bathla loves to explore all the possibility of personal development in all areas of life. He believes that everyone has the potential of achieving more than one thinks about himself. He is strong believer of the following. "If you think you can do it, you are right. If you think you can't do it then also you are right". Henry Ford. He has practical work experience in the corporate world of more than a decade and a half and he has personally implemented various techniques to improve the productivity at the work place and leads a happy personal and work life. His work explains that merely working on the outside actions without developing your mindset and belief will not yield the desired and lasting results. The philosophy behind this is that once you have worked on developing the resourceful mindset, you get a much better clarity on your skill set needed for outer actions. His goal is to help readers believe in themselves and assume their true power by working on their inner-self and outer world in a much-synchronized manner. Reviews of "The Quoted Life"